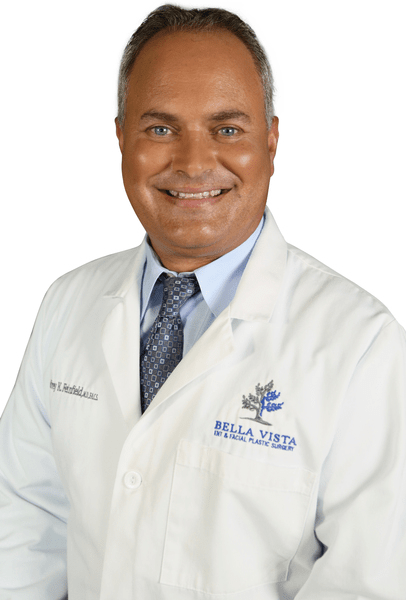 Jeffrey K. Feinfield, MD, Los Angeles and Thousand Oaks Plastic Surgeons at Bella Vista ENT & Facial Plastic Surgery. Dr. Jeffrey Feinfield is a well-respected board-certified otolaryngologist and facial plastic surgeon in Southern California. A California native, Dr. Feinfield attended the University of California at Berkeley and graduated with honors. He then went on to medical school at the University of Southern California where he completed his internship in general surgery and his residency in otolaryngology-head and neck surgery. His areas of clinical interest include sinus surgery, sleep apnea surgery, and facial plastic surgery. He is known for his skill in sophisticated endoscopic sinus surgery and minimally-invasive balloon sinuplasty. With a constant eye for new and less invasive surgical techniques, he stays abreast of current research through self-study, educational meetings, conferences, and workshops both locally and internationally. In the operating room and in the office, he is an innovator who continues to introduce new techniques. To date, Dr. Feinfield has performed more than 2,000 successful surgeries, and continues to be committed to forward-thinking medicine that results in safer and faster recovery for his patients. “Growing up in a family with a grandfather and uncle in the medical field played a key role in my decision to become a doctor. My grandfather was a pioneer in internal medicine and cardiology. He introduced CPR to the West Coast, established the first cardiac care unit in California, trained the first paramedics for the Burbank and L.A. fire departments, and later served as chief of staff at St. Joseph’s Hospital in Burbank, CA. As a young boy, I looked up to him, but it wasn’t until later that I realized the impact my grandfather’s eye for new inventions and techniques would have on my specialty and eventually my practice. Beyond the desire to help people, I find no greater reward than seeing the finished, brilliant smile my patients wear after a procedure. I enjoy sharing others’ dreams, aspirations, and successes and doing what I can to support them. The connections I make with my patients are truly invaluable. As one of the founders of Bella Vista ENT, I focus on the overall quality of my patient’s experience. I place great emphasis on the ultimate patient experience, using state-of-the-art techniques and technology, well-trained staff to educate patients and their families, and a relaxed compassionate environment. I like to use a dynamic, personal approach for each of my patients. I focus on discussing all treatment options available, and I involve the patient in the decision-making process. Each patient brings unique passions and dreams to the office. I customize each treatment to fit their specific needs. I love the challenge and knowing that I can rise to meet it. Furthermore, I am aware that my work can dramatically change a person’s life. It is an awesome feeling to be able to help someone on this level. As a surgeon, I continue to challenge myself and seek opportunities to find ways to better serve the medical field and my patients. Dr. Feinfield is a member of the elite American Academy of Otolaryngology-Head and Neck Surgery. He is also a member of the American Academy of Facial Plastic and Reconstructive Surgery. Each of these prominent organizations requires members to be accomplished plastic surgeons committed to high standards and quality care. Their logos symbolize that a plastic surgeon is highly trained and experienced in the field.